The Muncherjee Nowrojee Banajee Industrial Home for the Blind (MNB Home) was set up in 1956, in collaboration with the National Association of the Blind (NAB), to jointly address the needs of employable but visually challenged youth in the city, and provide them with vocational training for the purpose of generating income. MNB Home additionally has a residential hostel for the blind, to house those persons that have migrated from smaller towns and villages. MNB Home served around 121 visually impaired beneficiaries in FY13. The organisation’s plan for the coming year is to focus on creating awareness among the visually challenged individuals in the city and neighbouring regions, about the services and opportunities provided by MNB Home, and expand its outreach accordingly. Individuals: Income from individual donors formed the third largest source of income in FY13 at 16% (Ref: Fig.1), and increased by 12% over FY12 to amount to Rs2.1mn. Institutional and Corporate Donors: Donations from institutional funders dropped significantly in FY13, and amounted to Rs0.2mn (1%) as compared to Rs1.4mn in FY12. This was a decrease of around 87%. Similarly, corporate funding also dropped by 73%, amounting to just Rs0.1mn as against Rs0.5mn in FY12. (Ref: Fig.3) The management of MNB Home currently plans to increase awareness and fundraising efforts to mobilize donations from these sources in the coming year. Sales and Fees: MNB Home is able to generate a relatively large amount of income from sale of products made by its beneficiaries, and also through service charges for rent of its hall for third-party events. Additionally, nominal fees are charged to residents of the hostel. 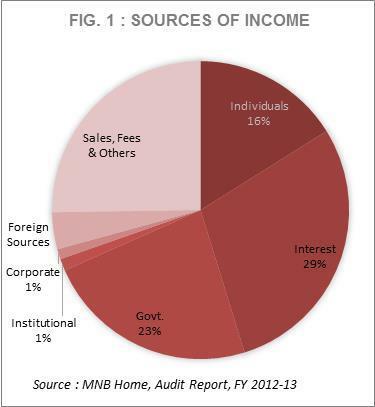 Together, these sources formed 24% of the total income in FY13, i.e. Rs3.1mn. However, there was a decline of around 17% in this source of income in FY13, owing to certain issues at the residential hostel (explained later, under the section on challenges). As a result, although sales increased by around 4% in FY13, income from fees and service charges dropped by 27% from FY12 (Ref: Fig.3). Investments: Investments held by MNB Home at the end of FY13 amounted to Rs45.7mn, increasing by around 2% over the previous year. Almost half of these investments were in the form of Government of India savings bonds, while the rest were fixed deposits with banks. 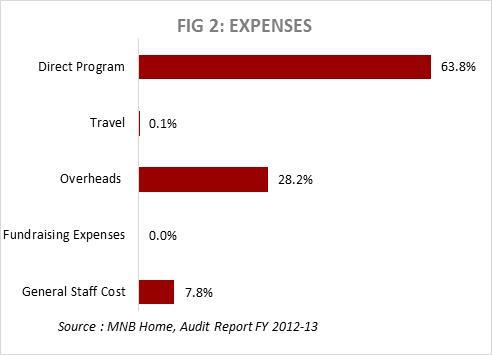 Program Expenses vs. Overheads: Almost 64% of the total expenditure by MNB Home in FY13 is attributable to direct program activities (44% program staff cost, 20% program inputs). The organization incurred no expenses on fundraising activities, with only a nominal amount being spent on travel costs. The indirect and administrative expenses formed around 28% of total expenditure, which can be bifurcated into 16% on actual overhead expenses, 4% on depreciation, 2% on professional fees and 6% on transfers to reserves. The spending on overheads (16%) is actually on the lower side when compared to NGOs that have invested in infrastructure, such as hostels and training centres. Reserves and Surplus: MNB Home has a large amount of accumulated reserves, totaling to almost Rs52mn at the end of FY13, of which corpus funds amounted to Rs19mn, earmarked funds to Rs27mn and general reserves Rs6mn. The earmarked funds have been set aside primarily to support the subsidized accommodation at the residential hostel, and for the self-employment scheme introduced for the beneficiaries. Provision has also been made for future repairs and maintenance of the hostel and main building. Due to the overall decrease in funds raised in FY13, MNB home had a deficit of Rs0.3mn in FY13, as opposed to the large surpluses it was able to generate in the previous two years (Rs2mn on an average). This is not only due to the decrease in institutional and corporate funding, but also due to the decrease in fees and service charges that it used to raise through the hostel and event hall. Fixed Assets: Fixed assets held by MNB Home at the end of FY13 amounted to Rs4.6mn, of which Rs3.1mn were immovable assets in the nature of building, for the main MNB Home and the attached hostel. Cash and Bank: Cash and savings bank balances at the end of FY13 amounted to Rs0.4mn, which was 80% lower than the Rs2mn worth of balance held at the end of FY12. 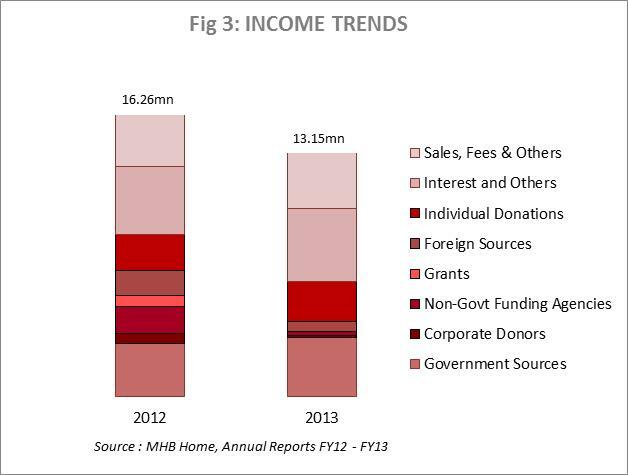 Income Growth Rate (IGR): The IGR of MNB Home witnessed a drop of almost 20% in FY13, mainly due to the large decreases in certain sources of funding, as explained above. While the growth of income has not been much of a challenge in the previous years (average 9% over FY11-FY12), the organization requires to widen its donor base as well as secure its internal income generation in the coming year. The management is currently working on the same. Self-Sufficiency Ratio (SSR): The SSR of an organization represents its ability to cover its operational cash expenses from steady sources of income such as individual donations, beneficiary fees, interest income, etc. The SSR of MNB Home has been in the range of 70-76% over the last 4 years, which is a healthy financial indication. The reassuring level of this ratio can be attributed to the organisation’s heavy reliance on sources such as individual donors, investment income and service charges/beneficiary fees. It is likely that the SSR will remain at this level in the near future as well. Dispute with current residents of the hostel: MNB Home has currently stalled the admission of new students to the residential hostel, as there are a number of current residents who are not vacating their accommodation even after completion of their 3 year term. Further, these residents have discontinued payment of hostel fees. The issue is currently under dispute, and MNB Home will be unable to undertake any further steps until the matter is decided by the concerned court of law. This has affected the fee income that MNB Home is generally able to raise. Commercial use of event hall: MNB Home would generally raise a large amount of income through rent of its hall for events. However, complaints of noise disturbance have been received from the hostel residents, as a result of which the organization has discontinued letting out the hall on hire. The management is currently reviewing alternate options to generate income from this space. Identification of vocations based on market needs: The traditional forms of vocational training for the visually impaired, such as candle-making, handlooms, etc. are losing their significance and income-generation ability in today’s job market. MNB Home is trying to identify occupations that are more popular, in order to assure their beneficiaries of employment post training. A computer centre has been set up for this purpose, which uses an audio interface to train the students in computer-based skills. As a result of this, students have begun receiving placements. For those interested in self-employment, MNB Home provides small grants to set up their businesses. Fundraising: The organization now has to increase its donor base in order to cope with the shortfall in income from fees and service charges, as well as to provide for future expansion of operations. This is a common challenge in the social sector. Government support has also been minimal, with only a salary grant being received from the State Government. The Board of MNB Home is chaired by Mr. Yazdi Tantra, Chartered Accountant and Director of On-Lyne Comtech, an international IT solutions company. The Secretary of MNB Home, Mrs. Najoo Mehta, also serves on the Managing Committee of NAB. The Secretary General of NAB, Mr. Ramkrishna, serves as Co-Chairman on the Board of MNB Home. He has the distinction of being the first visually challenged individual to compete in a competitive management entrance exam, and has recently retired as General Manager of IDBI Bank. He was also featured in a book authored by President Abdul Kalam, on the forty most successful disabled people. Treasurer of the Board is Mr. Pranav Mazumdar, who is a senior member in the tax department of CA firm Kalyaniwalla & Mistry. It may be noted that this firm also audits the accounts of MNB Home.